We got another 4 inches of snow yesterday, that conveniently fell entirely and only during the time I had things to do and had to be out and about, but that's always how it goes. I am hearing the weather is going to get warmer this week but I'll believe it when I see it. The tourists on the subway, decked out in their cold-weather I Heart NY gear because they didn't anticipate this weather and assumed buying something from the guy on the street was the cheapest way (tip: it isn't) reminded me of how much I wish I could be wearing the clothes they anticipated wearing when they packed those heeled ankle booties that you'd surely sprain your ankle wearing on these ice coated sidewalks and the thin leather jackets that keep you minimally warm but maximally cool. So the rest of the evening was spent cuddled up with warm brownie cobbler and catching up on episodes of TV. 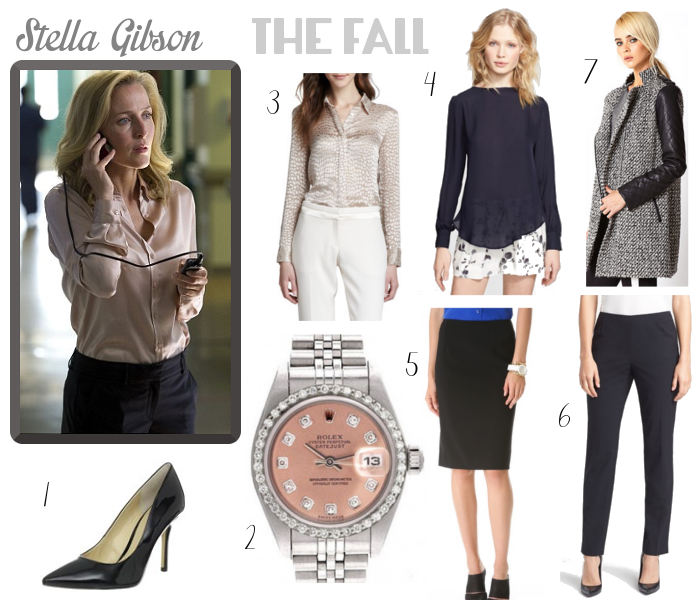 I am inspired so much by women on TV and their style, and as such I decided to do a "things I want/things I am loving" based around items that my favorite TV style icons would wear. 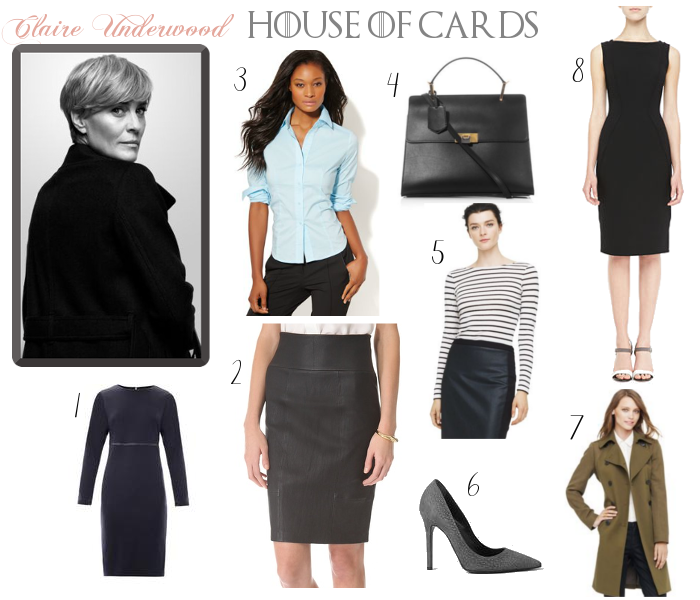 Let's start with the formidable, inimitable woman who reminded me of my love for TV characters' styles in the second season of her equally inimitable Netflix Original series, House of Cards: Claire Underwood. Claire is above all things incredibly put together. She wears highly streamlined clothing that would be vaguely androgynous if there weren't so many dresses and skirts in the mix, and she wears it incredibly well. Her power bag of choice is the Saint Laurent Muse in the first season, but I think this Le Dix from Alexander Wang's first bag collection for Balenciaga suits her style very well. I can see her in any and all of these items, and therefore I want them all. 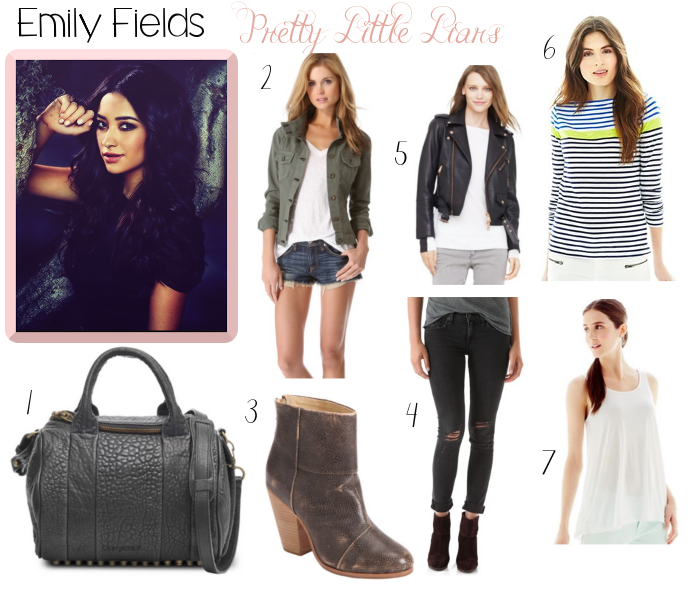 Taking it down a notch, back to high school (if your high school was filled with girls who looked like they just walked off a runway and are in their mid twenties), we have the super casual and cool Emily Fields from Pretty Little Liars, a huge guilty pleasure of mine. If the Rag & Bone aesthetic could be a person, Emily is that person. She is impossibly cool all the time in layered flannel shirts and leather jackets, with tons of those denim jackets with leather sleeves I've been coveting lately. I think that had I had her style (or wardrobe!) in high school, it would hold a lot better memories for me. The next one is the most basic: Marnie Michaels of GIRLS is how many of us dress already - basic, plain, feminine. She does it impeccably, though, and always manages to look very put together and classic. I love Marnie's style, and can always picture myself wearing her clothing without needing to change my lifestyle and get a higher powered job as a CEO somewhere. She's just your regular girl, as (I think) her character is written on the show, and her clothing reflects that. Olivia Pope is the woman who started it all for me. I drooled over her clothing the first season and desperately Googled the items she wore, trying to find them for myself. The reason I even started buying things on eBay was because many of her clothes were from former seasons and that's where I was able to find them. 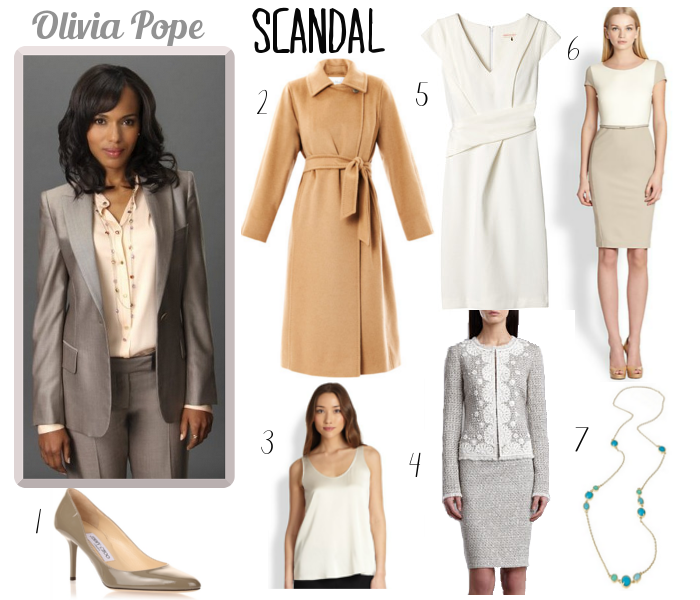 I desperately collected the few items I could find that she wore and cherished them, wearing them to death, praying that I looked anywhere near as polished and powerful as Ms. Pope did in them. I probably didn't, but hey I tried. I love everything she wears, and I could see her wearing all the items here easily (the only long shot being the St. John suit which if she wouldn't wear, well she should). Even her pajamas (usually a silk tank and loose silk pants and a big comfy cashmere sweater to drink wine in) are enviable. I want the MaxMara coat and dress here so badly - they are both so understate and gorgeous. The longshot, the one who many of your here may not know, is Stella Gibson from The Fall. I wrote about her in my post on The Female Antihero and even though I was critical of her protrayal there, I have no critiques about her costume and wardrobe. She wears silk blouses probably every single episode, and she rocks them. Her light colored blouses flatter her pale coloring so well that I even started searching for some for myself. I love this watch for her because it is masculine with just a slight feminine twist (the pink dial) which reminds me of her - she wears very menswear inspired suits and jackets with button downs, but the materials give her otherwise androgynous outfits a nice, subtle feminine aspect. I doubt she'd wear anything from Forever 21 but I think she'd wear this coat here very well. Oh, and I now have that Haute Hippie Alligator Silk Blouse on sale alert because I love it so much - I'll let you guys know when it gets reduced too. For style inspiration, I like TV because you see the same person wearing different things - sometimes it's helpful in trying to keep a consistent personal style and not constantly feel like your wardrobe is missing the elements you need to make the outfits you want. What TV Characters most inspire your style? Or do you prefer street style, blogs, or movies to help inspire your outfits?